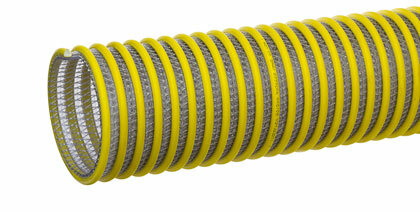 Tigerflex™ Solarguard™ WST-SLR™ Series hose is a heavy duty PVC fabric reinforced suction & discharge hose with High UV Resistance. It is made with a specially formulated material to resist the cracking that can result from exposure to damaging UV light. Tests show the Solarguard™ material retained 97% of its original tensile strength after prolonged UV exposure. The high tensile strength polyester yarn jacket handles both suction and higher pressure discharge applications. Click here for more info.